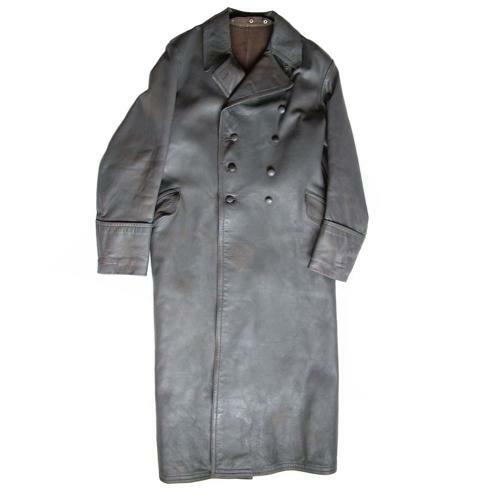 High quality private purchase greatcoat manufactured in heavy duty blue-grey dyed fine grain leather. Double breasted front with a vertical row of six pebbled buttons each side as per regulations. Large skirt with single deep vent and a half belt with two buttons at the waist. Large 'French' cuff sections and angled slash pocket with flaps each side of fhe skirt at waist level. Fully lined in a grey-brown cotton twill. Buttons inside allow for an additional liner to be attached. Features include an internal pocket & zipped skirt seam pocket (Ri-Ri zip), adjustable internal belt for improved fit, internal skirt strap and horizontal opening/rings beneath the left pocket flap for attachment of a dress dagger. Worn with detachable shoulder boards. The leather is in very good overall condition, thick, strong and supple. There are areas of wear but nothing significant although it should be noted that the colour appears to have been partially refinished for a more evenl patina. The coat was also slightly modified after the war, the half belt extended around to the front, internal strap cut/extended and front buttons moved slightly to allow for a larger fit. These have largely been reversed with removal of the 'extra' belt, reduction in the size of the inner strap to original proportions and removal of shoulder board loops. Approximately 40" chest (actual measurement) and fits about 38" chest over a sweater. It has long arms and a generous length of about 52" from collar seam to hem. As a guide I am 6'2" tall and the overall fit is very good for me. Not perfect but a very good original greatcoat and a superb display piece. Further photographs available on request. Rare to find. Stock code U22757.